A technician works to remove an odor from a vehicle. Bad smells can cut the price buyers are willing to pay for vehicles, a study by Manheim concludes. The stench of a dead human body was one of the most unsettling smells Frank Simmons has had to remove from a used car. It "was only one time," he said, but "it was a real different odor." 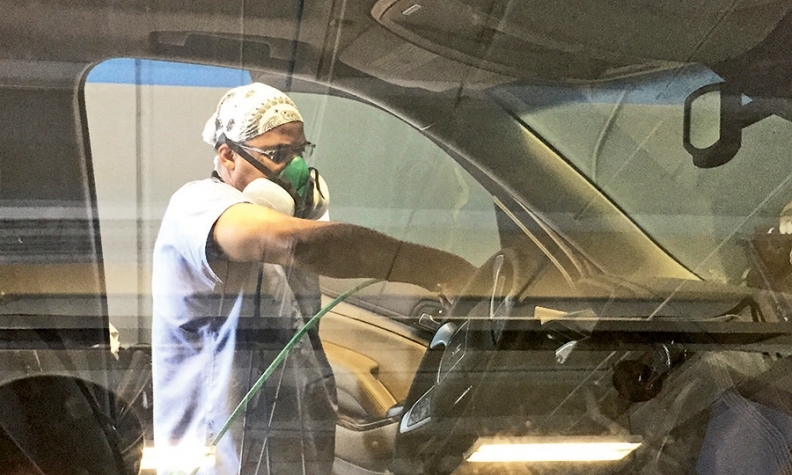 Simmons, 64, a former new-car dealer and founder of Odor Doctors, specializes in helping customers out of smelly situations, often clearing the air inside used cars and trucks so dealers can sell them. Cigarette smoke. Pet urine. Skunks. Vomit. Gas-oline spills. Rat and roach droppings. Rotten food. Sour milk. Roadkill stuck in a car's undercarriage so that the stink came through the vents. A spilled container of coyote urine that was supposed to keep skunks out of the garage. Those are just some of the smelly facts of life that can lead to odoriferous cars or trucks. Dealership salespeople and consumers avoid these stinkers, causing the vehicles to languish on the lot and lose value or get sent to the nearest auction. 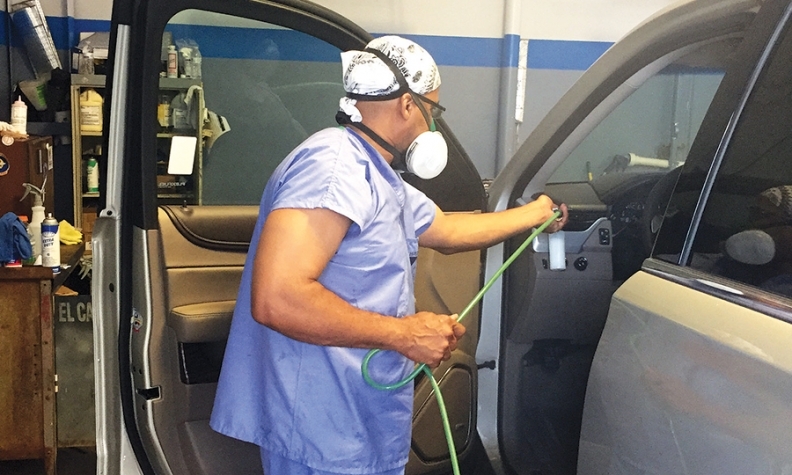 Simmons, sole owner of Odor Doctors, of Houston, has four employees -- including his son -- and 25 independent contractors that service about 500 dealerships in 25 cities around the country. Most of his customers are concentrated in Texas, Florida, Georgia, North Carolina and South Carolina. Simmons would not divulge Odor Doctors' revenues but said he expects to expand into an additional 125 cities within three to five years. 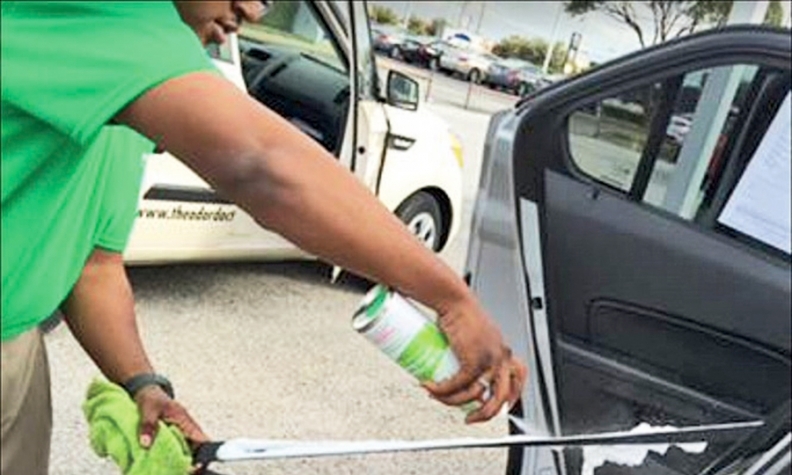 Getting rid of odors in vehicles is big business for companies of all sizes. An online search for car odor remedies yields a vast selection of do-it-yourself products and methods to neutralize, control, remove, freshen and get rid of vehicle odors. Joy Fisher worked for two years developing what she described as an environmentally benign odor neutralizer in a jar for stinky vehicles. She tested it in dealerships and elsewhere. But she folded the tent of her Clodico Inc., of Knoxville, Tenn., at the beginning of the year. It wasn't that the product didn't work, she said. It was because a "major disagreement" erupted with the licensor of the technology that was to go into her product. Fisher believed in her product, but noted that there are "hundreds" of competitors. "We were actually ready to go to market. We decided to shut the company down," she said. "It is very difficult for anybody to break into this market unless they have something that is exceptional." Cheap cigars produce the "worst" everyday smell in used cars that Simmons has to deal with. That stench means less money for dealers, especially if the vehicle isn't in great shape. In a September 2013 study, "Vehicle Odor Impact on Auction Price," Manheim, the nation's largest auto-auction company, found that the poorer a vehicle's condition, the more its price is affected by odor. The study concluded that "smoke or foul odor may lower retention up to 3 percentage points," or "$300 on a $10,000 vehicle," as priced in the Manheim Market Report. It also said dealers may spend even more money trying to remove or disguise the odor. Manheim handles the sale of nearly 7 million vehicles annually and offers odor removal among its many services. Consider the odor that struck Erik Fisher's olfactory nerve from a two-door, 2007 Chevy Cobalt. It was a clear case of a good car smelling bad. The car was about five years old, had only 30,000 miles and otherwise was in good condition. But it stank: "a smoky, mildewy, musty" odor, recalled Fisher, the used-car manager at Dodge of Burnsville in Burnsville, Minn., with a chuckle. His guess: a problematic evaporator. His cleanup crew scrubbed every inch of the vehicle "five or six different times" to no avail. The workers used a machine that fills a vehicle with a form of oxygen similar to that found in the Earth's ozone layer that is supposed to neutralize odors. It still didn't pass the smell test. That's when he turned to Odor Doctors. "We ended up spraying it down, fogging it two, three times," he said. "Eventually, the Odor Doctors' products worked it out. "We worked on it 60 days until we finally got it clean enough to make it go away -- to a point where we could retail it." In 1988, long before tackling vehicle halitosis, Simmons acquired his first dealership, Monroe Dodge in Monroe, La. He sold that store and then owned Hilltop Chrysler-Plymouth in suburban Dallas from 1993 to 1999. On July 19, 2001, he opened a store, Shakopee Dodge, in Shakopee, Minn., a suburb of Minneapolis. But sales collapsed a couple months later in the wake of the terrorist attacks of Sept. 11. By 2004, he had had enough and "got out of automotive retail." But ever the entrepreneur, Simmons soon started a new business, Marketing by Zip Inc., which specialized in website marketing for dealerships. Shortly after that, he took on a second role, as a manufacturer's distributor of a product to treat vehicle evaporator odors. He soon realized there was a lot more to bad vehicle odors than bad evaporators. The Odor Doctors was born in 2006. He still owns Marketing by Zip. "I started doing research and found a source for this and a source for that. That's when I formulated the concept for the Odor Doctors," Simmons said. "We would take a professional approach for this." Simmons stresses that his company cleans bad odors, not bad messes. In fact, he said, vehicles must be detailed to a retail-ready condition before his technicians will touch it. Marijuana, spilled liquor and beer and vomit are "common" odor-producing culprits "around prom time," he said. His company also once treated a car in which cigarette butts had been stuffed into its vents. Burnsville Dodge, an early adopter of the Odor Doctors concept, is one of "three or four" dealerships that buy the products from Simmons for use by dealership employees, Simmons said. In other instances, technicians go to dealerships to apply the product. The process takes about 45 minutes for a car and up to an hour and 15 minutes for a SUV. The cost is $150. "We guarantee the work," Simmons said. "Three percent of the time, we have to re-treat the vehicle. They don't pay" if subsequent applications are needed. Among that 3 percent was a car belonging to a dealer's wife who used the vehicle to transport a pot of red beans and meat, he said. She slammed the brakes, and the pot and its contents went airborne. Making matters worse, the incident happened over the Fourth of July holiday last year. The fermenting beans and rotting meat sat in the car for "three or four days." By the time Simmons was called in, the pungent odor had permeated every inch of the vehicle. After treating the car about four times, Simmons said, a faint odor still lingered. He advised his customer, the dealer, to replace the carpet. The customer refused. So far as Simmons knows, the car is still on the lot.